As you may already know, the future is now. And when you stop and think about it, it really is. It’s the 21st century and things which not long ago were science fiction are now so commonplace we don’t even notice them anymore. My mobile phone doesn’t need buttons because it has a touchscreen. It also probably has more computing power than the Apollo missions used to get men to land on the Moon. The notebook I throw in my bag every morning has a pocket containing an SD card which can store 16 gigabytes of data. And finally, one of my favourite geek toys is a violet laser. With a wavelength of 405 nm, it produces a lovely colour which cannot be recreated by either inks or any regular display screen. Lasers are literally everywhere, and they have been since the advent of the compact disk. But humanity should have had access to laser technology long long ago. Well before we actually acquired it. Applications for science funding always ask about things like “how your research may benefit society at large” and “what impact your work may have on society”. This always bemuses my astronomical friends no end, because clearly it’s not particularly obvious how astronomy research may benefit society at all. But sometimes, just sometimes, the potential benefits are overwhelming. Had the world paid more attention to radio astronomy, for instance, laser technology may have been around a lot sooner than it was. “Masers and lasers have of course been of economic and technical importance, as well as of scientific interest. I sometimes point out to politicians and other administrative types that if radio astronomy had been sponsored more strongly in the United States we probably would have had masers and lasers sooner. Masers could have been detected long ago in the sky – probably as early as the 1930s, and certainly immediately after or during World War II they could easily have been detected, but nobody was looking. The United States as a whole did not do very well by radio astronomy shortly after the war, as compared to the British and the Australians. They generally did a wonderful job, but still not quite enough. Is astronomy research important? Yes. Potentially a lot more important, and for a lot more reasons than most people care to realise. Most people, including the astronomers themselves. 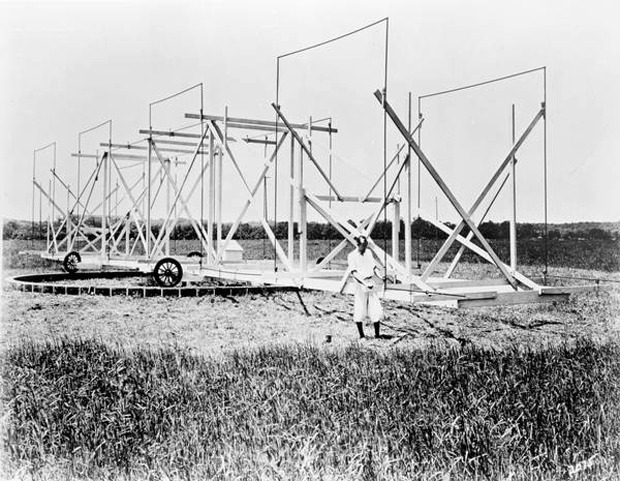 The above image is of Karl Jansky and his rotating 20.7 Mhz antenna. Little more than an aerial-laden aeroplane wing on car tyres in a potato field. But it was with this antenna that Jansky made his discovery in 1932 of a strong source of radio emission coming from the centre of the galaxy, beginning the entire field of radio astronomy. With the exception of a young engineer in Wheaton, Illinois, named Grote Reber, Jansky’s work was largely ignored by the scientific community. This entry was posted in astronomy, Imported from Livejournal, physics and tagged culture, technology. Bookmark the permalink.